I caught part of a dicussion on Facebook recently where someone mentioned, in a "Hey, did you know..." fashion, that Bob Kane dated Marilyn Monroe for a while. Someone with some degree of authority on comics (Can't remember who exactly... Jim Amash? Gene Kannenberg? Someone like that.) responded that that was most likely a load of malarky. The discussion then went into a long back-and-forth about how Kane often stretched the truth quite a lot, not infrequently to the point of being an outright liar. Naturally, the long omission from comics' history of Bill Finger as Batman's co-creator came up. Well, I say "naturally" but to the person who first brought up the Marilyn Monroe comment, it wasn't obvious at all. He'd never heard that. Marc Tyler Nobleman has probably done the most research on Finger and his contributions to the Bat-mythos, but his biography of the man came out less than a year ago, so I can understand how this responder may have not yet seen that. But I distinctly recall having a conversation about Finger as Batman's co-creator when I was in high school back in the 1980s. It was in the biology classroom with another comics fan in the desk behind mine; I don't remember if it was before class actually started or if we were just ignoring the teacher or what, but I know that Finger was the point of discussion and, while neither of us knew very much about him, we both recognized that he had a hand in Batman's origin. Another conversation I caught part of on Facebook earlier this week surrounded the mystery of who it was that actually donated all the original art from Amazing Fantasty #15 to the Library of Congress back in 2008. The gift was made anonymously with no real hints made public as to who might have made the donation. 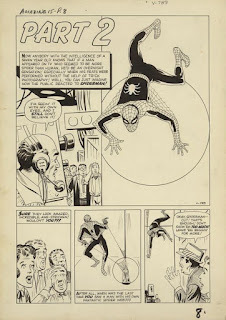 Steve Ditko's name came up as an obvious possibility as the original artist, and someone else brought in a story he heard that it had come from Marie Severin. Obviously, the mystery wasn't solved in a short back-and-forth on Facebook, but Arlen Schumer put forth the most compelling arguement in favor of Ditko himself. Most of the people who weighed in on the subject seemed surprised at the idea but, as I suggested, no one had better arguements for anyone else. Ditko kind of always made sense to me -- how many other people would have had access to the entire story, were still alive in 2008, and tended to avoid publicity -- but it wasn't a mystery I honestly put much thought into. There was an old saw comics editors used to tell their writers: every issue is somebody's first. Which meant that any given issue of a comic could be the first time a reader is picking up that particular title, and you can't assume they know anything that's happened before. That doesn't mean you need to do a full recap of the characters' histories and everything, but you need to provide enough information for everyone to follow along. Journalists write in much the same way, and that's why the second, third and maybe fourth paragraphs of a news story are often rehashes of stuff you already knew if you'd been following the events in question. If you've never read a news story about Venezuela, for example, you might not have been familiar with the name of Hugo Chávez, much less why it's significant that he died. Part of my point here is to remind myself that what I know about comics and comics history may not be known to everyone who reads my work. Even if I think it's common knowledge. Another part of my point is to remind everyone else that not everyone is coming to the table with the same knowledgebase that you are, and maybe they're not the modern personification of Adolf Hitler because they don't know whatever the full history/origin of Hawkman is this week.